1998 champion Joe Dragan returned to WBC after an eight-year hiatus. He is shown at left in action against Bob Jamelli. Meeting of champs: Defending champion Andy Gardner (left) opposes Rob Flowers, the current BPA email champ. This year's Pre-Con saw players face off in 91 games, up from 89 last year. Champion Ed Menzel (6-1) took the honors by way of his head-to-head tie-breaker victory over Andy Gardner (6-1) in Round 4. The Nagumo Award (Best Japanese Player) goes to Andy Gardner, with an IJN record of 5-1, closely followed by Mike Kaye's 5-2 IJN mark. The Halsey Award (Best Allied Player) goes to Champion Ed Menzel, with his 4-0 score for Allied play. Also in the running were John Sharp (Allies 4-2), James Eliason (Allies 4-2) and Joe Dragan (4-3 as Allies). The IJN won 48 of 91 games, or 52.75% (2005: 50.56%). The Allies won 42, or 46.15% (2005: 49.44%). One game ended in a tie (1.10%). Bids were a bit higher this year. Average bid overall: 3.105 (2005: 2.66). The average bid in no-bid games was 3.576 (2005: 3.35). Bidding was more prevalent, with 79 games featuring bids (2005: 71), and 12 games with no bids (2005: 18). This year, 12 victories were changed by the bid (2005: 5; 2004: 3), so bids are becoming more important as the raw POC scores drop and fail to maintain winners. 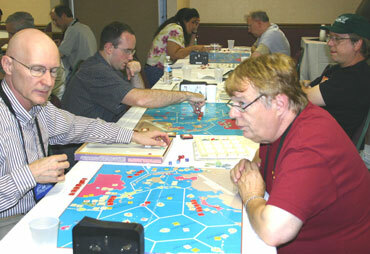 First round matches were determined by random draw, giving newer players a chance to go up against the top AREA VIP admirals. 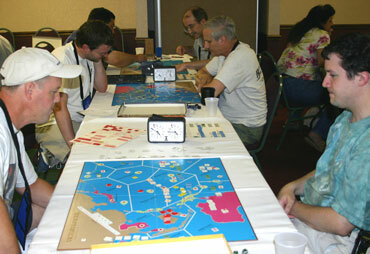 In this year's opening round, Scott Beall played Mike Kaye, Rob Beyma played Ed Menzel, Kirk Butler played Jim Eliason, Bob Jamelli played John Sharp, and Mark Booth played Mike Ussery. Next year, random matching will NOT be used in the first round. All players will be ranked by AREA rating, and the bottom half will be matched against the top half. Example: 20 players, 1 plays 11, 2 plays 12, 3 plays 13, and so on (as the later rounds are matched within their win brackets). By the end of the third round, only three players were undefeated: Gardner, Menzel and Sharp. In the 4th, Menzel topped Gardner to break that clinch, and Sharp squeaked by Rob Flowers to stay at 4-0. In Round 5, Menzel made mincemeat of Sharp to stay atop the pack with the only undefeated record, dropping Sharp to 4-1. Round 7 saw three players at 5-1: Andy Gardner, Ed Menzel and Mike Kaye. Menzel drew Rob Drozd, whose match ended in an IJN victory for Ed in an IJN knockout. Mike and Andy's game went a full eight turns, with Andy pulling out the Allied win.